“High-quality plastic flatware that can be hand washed and used several times." With its sleek, graceful lines, Oneida’s Mooncrest Flatware Set has an almost universal appeal. And no matter how many people are at the dinner table, there’s a set that should work: Oneida sells its Mooncrest flatware in 20-piece, 45-piece, and 65-piece sets. The 45-piece set includes eight settings 5-piece settings which include a dinner knife, dinner fork, salad/dessert fork, soup/cereal spoon, and teaspoon. The set also includes five serving pieces—two serving spoons, a serving fork, a sugar spoon, and a butter knife. Reviewers love the set’s unadorned, simple look, which helps it fit with just about every type of dinnerware. A few warn that the shiny finish shows water spots and smudges too easily, however. They also say the individual pieces have a good weight and simply feel good in the hand. This 18/0 stainless steel set is dishwasher safe and has a limited lifetime warranty. Though most users say the set seems durable and some report years of trouble-free use, a few say they had issues with rust after a short period. Buyers who want a more classic look, or those who need a sturdy set for bigger families or dinner parties, will want to check out the Lenox Portola Flatware Set. This 65-piece set includes 12 settings of five pieces each: dinner knife, dinner fork, salad fork, soup spoon, and teaspoon. It also has a hostess set with a sugar spoon, butter-serving knife, cold meat fork, tablespoon, and pierced tablespoon. The Portola flatware has a more traditional look than the Oneida Mooncrest, with small circles and bands on the end of each handle. Reviewers say the embellishment is still understated enough to suit most tastes and casual enough for everyday use, however. Each piece has a pleasant weight and balance according to reviewers. This 18/10 stainless steel set is tarnish-resistant and dishwasher safe. There are few reports of scratches, rust, or tarnishing, and the set comes with a limited lifetime warranty. The Cambridge Silversmiths Heather Sand Flatware is an ideal option for traditionalists who don’t have much to spend; it’s also backed by a relatively beefy warranty for such an inexpensive set. This 20-piece set includes four settings of five pieces each: butter knife, dinner fork, salad fork, spoon, and teaspoon. Each piece of the Heather Sand set features a graceful swirl design on the subtly scalloped handles. The brushed finish is a bit subtler than flatware that has a mirror-like finish. Overall, reviewers say the look is somewhere between casual and elegant, making this set versatile enough for everyday use or more formal dinners. Most say the pieces have a decent weight for a budget set, though some complain they are too light in the hand. Made of 18/0 stainless steel, this set is dishwasher safe. It’s backed by a 25-year limited lifetime warranty. Most reviewers say quality is good, especially for the price, but there are some reports of bent handles and rust spots. 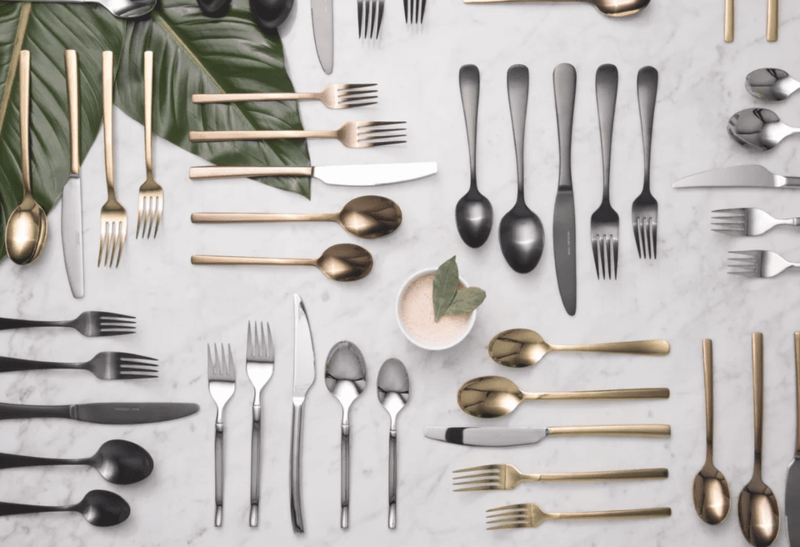 Anyone who’s willing to pay the price for a more innovative set of flatware will want to check out Knork’s 20-Piece, 18/10 Stainless Steel Set, which is hand-forged and designed specifically for better ergonomics. 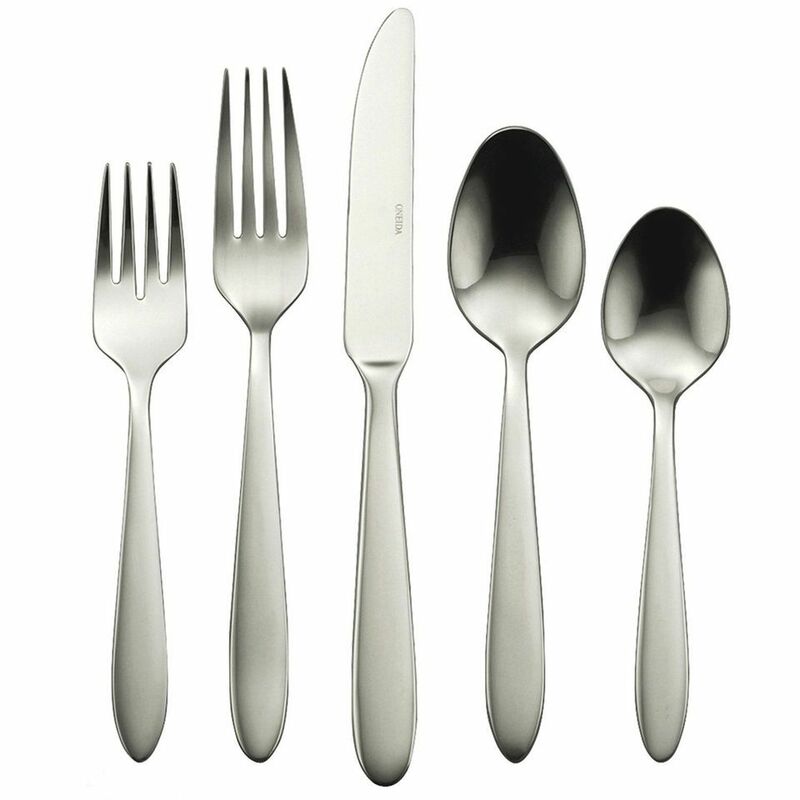 The set includes four sets of five pieces each: dinner knife, dinner fork, salad/dessert fork, spoon, and teaspoon. This Knork set has a clean, modern design and a matte finish. The flatware also features several small tweaks to make eating just a bit more enjoyable: There are larger, easier-to-grip handles, as well as a finger platform at the neck of the utensil. Plus the longer, curvier tines on the forks make cutting food easier. Reviewers appreciate these tweaks and say the fork is sharp enough to double as a knife on many occasions. The 18/10 stainless steel is dishwasher-safe and comes with a lifetime warranty; reviewers say the pieces are heavyweight and feel built to last. A less-expensive 18/0 stainless steel set is also available, as is a glossier finish. If you are a frequent entertainer, you might also consider investing in some high quality plastic flatware as well. This set from Reflections could almost pass as real silverware at first glance, but the high quality plastic comes in a large quantity set at a fraction of the cost of a traditional place setting. The set includes 80 plastic forks, 40 plastic spoons, and 40 plastic knives. They can be hand washed and used several times, but because they are inexpensive, you won't have to worry if a guest accidentally tosses their place setting in the trash. Your flatware set should be fun. After all, you’re going to be using this with your friends and family. And you’ll be using this set at least once a day depending, so it would be nice to have set that you can enjoy and be proud of. Forget the standard silverware, why can’t we have fun with colored metals that fit better with aesthetics. This set can perfectly meld with rustic, glam, and mod dishware for various events. They also make perfect everyday utensils for the family. The handles are squared, a refreshing detail. You could also buy multiples of the same set in different finishes to really impress your guests. Sometimes something laid back and casual is what you are going for — whether that is for everyday use or perhaps outdoors in the summer. This Cambridge set is the perfect match for when you just want to kick back and relax. Available in both a 16 and 20-piece setting in black, white, blue or red this flatware would look great mixed and matched for all of your Fourth of July parties or just as one solid collection. The set is dishwasher safe and made of 18/0 stainless steel making it durable. What we love is that is has a 25-year warranty so it will be with your family for decades. Can you really get a decent set of flatware for a song? Customers resoundingly say yes. Many say they’re pleasantly surprised, shocked even, as to how just how nice and durable this set from Mainstays is given the price. One reviewer said, “All items are heavy duty and well made. I can't believe they can sell them for this price.” But they do. The 20-piece set comes with four place settings, each of which includes a salad fork, dinner fork, teaspoon, soup spoon and dinner knife. Made of stainless steel, the design is traditional with a bit of crisscross detail at the bottom of each piece. Overall, it's a clean, classic flatware set that won’t set your budget back too much. Flatware doesn't only come in more traditional patterns you can also get contemporary shapes that are sleek and refined. This 20-piece set would look great next to basic white plates as well as more trend-focused china patterns. And just because it has a simple silhouette it doesn't mean it is casual. This can be dressed up or down depending on the occasion and the simpleness of it will prevent you from getting sick of the pattern over the years. Reviewers love the mid-century design and weight on it though they have a few comments on washing to prevent rust like using a non-acidic dish soap. Our reviewers spent 23 hours testing one of our readers’ favorite flatware sets. To get the most comprehensive results, they used it during every meal for weeks on end. We asked our testers to consider the most important features when using this set — from its design to its ease of use — and we've outlined them here so that you, too, know what to look for when shopping. Number of place settings It makes no sense to get 12 place settings if you’re moving into a tiny apartment. However, if you regularly host dinners in your spacious dining room, buying a large set is much more affordable than buying multiple smaller ones. How many people are you looking to feed? Design Think about what style of dishes you own. Flatware with a more plain design will match well every style of plate, while sets with more ornate designs or vibrant colors might be the perfect companion for your holiday dishware. It’s all up to you. Ease of use More than anything, flatware is meant to be used. When choosing the perfect set for you, consider if the handles are easy to hold — including for kids, if you have them. Also, are the forks, knives, and spoons a reasonable shape and size? It’s no fun eating if the flatware makes it a chore. If you’re looking for basic flatware, our reviewers recommend this Oneida Mooncrest set. However, our testers agreed that the utensils felt “cheaper” and that their design was very plain: “I wouldn’t choose to use this set if we were planning something a little more special,” one reviewer said. Additionally, one of our testers wasn’t a fan of the material: “I could absolutely bend the handles and over time, I found that the forks started to bend,” he explained. On the plus side, our reviewers reported that the flatware held food effectively and was easy to clean, both by hand and with a dishwasher.